There’s very little in life that gives us more joy and pleasure than the relationships we have with our pets. They’re loyal, pick us up when we’re feeling down, and never judge us! All they ask for is food and love, which we are more than willing to give. By the same token, the love we experience for animals makes losing a pet a very traumatic experience for a pet owner to go through. Whether it’s a dog, a cat, or a guinea pig, it is a harrowing experience that we wouldn’t wish upon anyone. Nguhi Muturi from Dallas, Texas, was nine-years-old when she got her kitten, Panther. She was completely besotted with her new best friend. “I loved him to pieces and used to write about him for every daily journal entry in school,” she told a journalist from the Press Association. 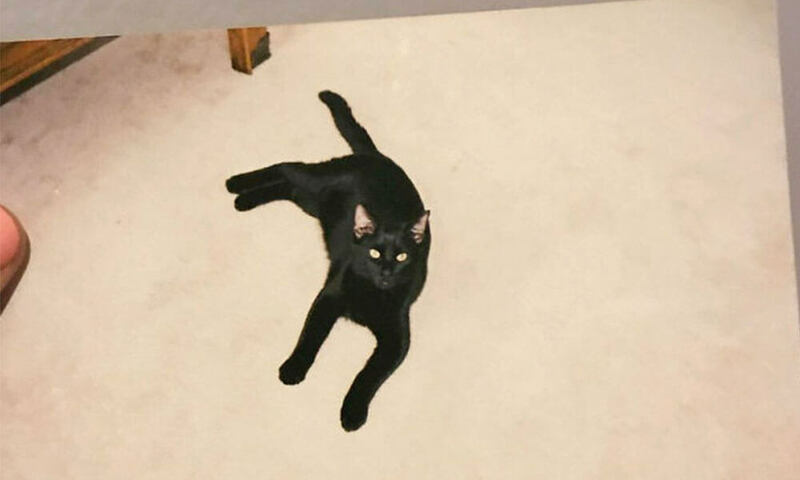 “We adopted him when he was a kitten, months after we moved into this home.” Nguhi and Panther happily lived together until the girl grew up and had to leave for college. She was adjusting well to life in her new college town. However, during this time, Panther left home and didn’t come back. “He slipped out of the house and never came back.”, she recounted. 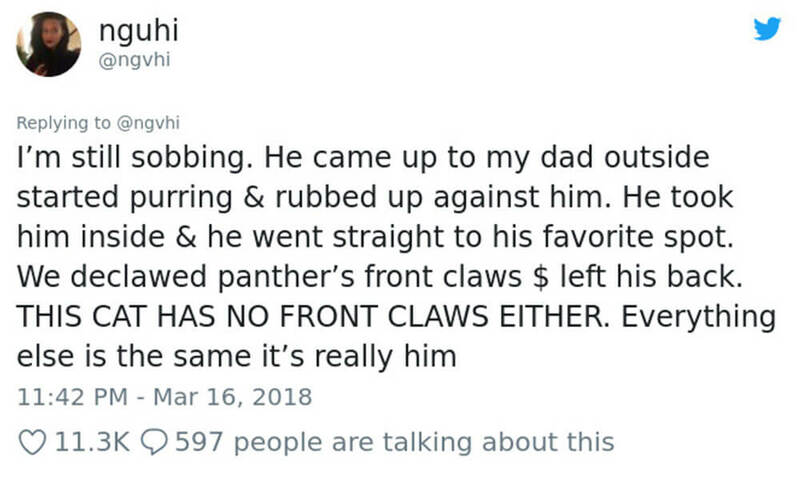 Of course, Nguhi was devastated to hear this news from her parents and felt that Panther may have run away because he felt abandoned by Nguhi when she left for college. Naturally, this made her feel terrible. Eventually, she managed to make peace with her loss – she assumed the worst, and moved on, carrying on with her studies and eventually going away to college. Five years and a few crazy twists of fate later, a cat resembling Panther showed up at the Muturi household. After Nguhi’s parents were shocked with how much the cat resembled Panther, so they decided to get a closer look. They checked out his paws, and couldn’t believe it – it was him! Yup – by an amazing twist of fate, the cat was indeed Panther, hanging out in the same spot he used to, five years after he went missing! As luck would have it, the woman’s parents also turned out to be the next door neighbors of Nguhi’s parents! We’re crying! Of all the coincidences! So Panther recognized where he was, and almost straight away, he went to his old spot in the garden. So cute. 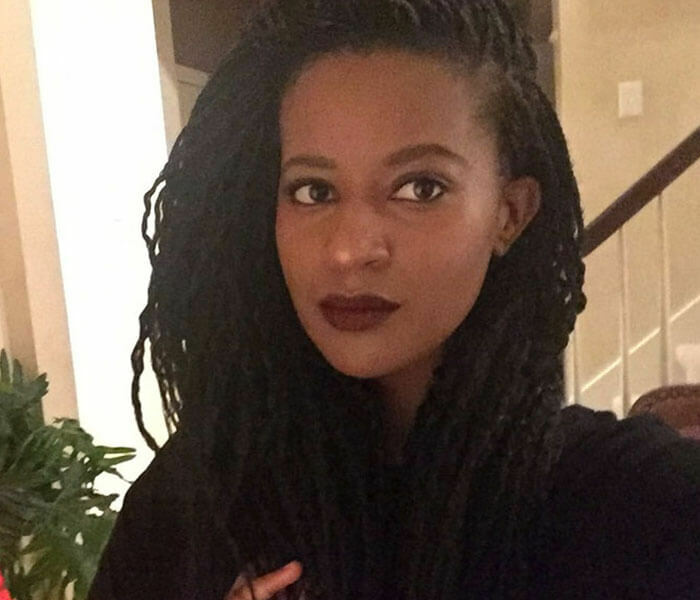 “I can’t believe this is real because I am still in shock,” Nguhi wrote on Twitter. 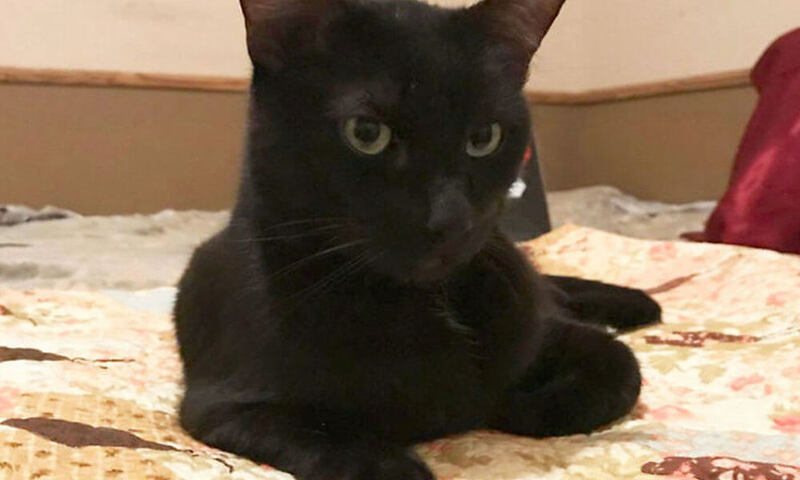 The neighbors insisted Panther should stay with her former owners, but they decided this was not possible and gave him back since a new cat and dog were already growing up in their home. However, Panther is now just next door, and the Muturis can go and see him any time they want! What a happy ending! Of course, Nguhi was upset that she couldn’t take Panther back in, but more than anything, she was just so happy to see her old friend. This story warmed our hearts! What did you think? Have you ever had a beloved family pet leave, only to return a long time afterwards? Tell us all about it in the comments – we’d love to hear your stories. You can follow the Aunty Acid page on Facebook for more stories like this!